WHEN: Feb. 16 through March 3, Fridays and Saturdays at 8 p.m., and Thursday, Feb. 22nd at 8 p.m.
For reservations, call 908-472-1502 or visit alliancerep.org. Longtime friends Doug (David Federman) and Kayleen (Kelly Maizenaski) measure their lives in stitches, scars and hospital stints. Kayleen's internal agony, including intense stomachaches, is only matched by daredevil Doug’s array of disfiguring accidents. Over the course of thirty years, this scar-crossed pair meet again and again, brought together by injury, heartbreak, and their own self-destructive tendencies. 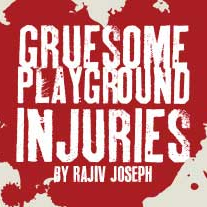 Gruesome Playground Injuries is a compelling and unconventional “love” story about the intimacy between two people when they allow their defenses to drop and their wounds to show. What critics have to say about Mr. Joseph and this piece: "Rajiv Joseph is an artist of original talent." —NY Times. "Irresistibly odd and exciting…This darkly humorous drama is Rajiv Joseph's most satisfying work." —NY Daily News. "This wondrous strange two-hander finds as much humor as horror in the play's bizarre events." —Variety. To learn more about Alliance Repertory Theatre Company and the rest of the 2017-2018 season visit alliancerep.org.